Outdoor patio with gas grill. Living room with view of bonus room that can be used as 3rd bedroom. Master bedroom with queen bed, tv, dvr, ceiling fan. Bedroom #2 with 2 twin beds. 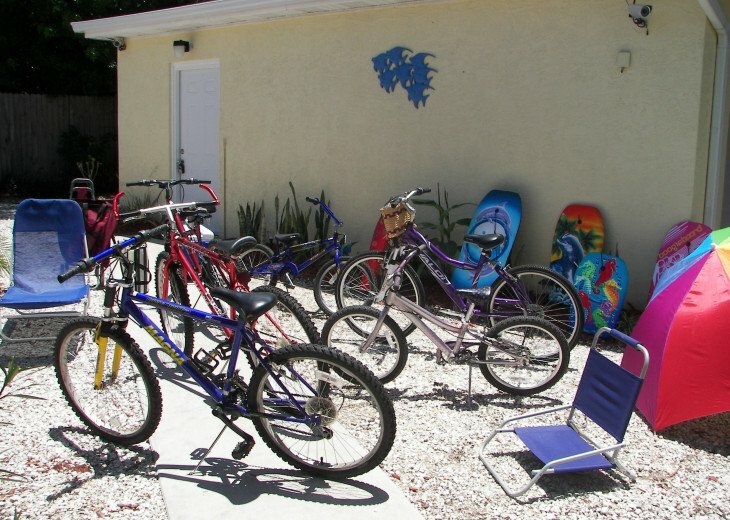 Bikes, beach items for our guests. Additional parking for boats, trailers, etc. 2 bedroom, 1 bonus room, 1 bath home in a charming, quiet community has all the amenities you need for short stays, that special occasion, that special Daytona event, or for an extended snow bird stay. We accommodate a party of up to 4 adults (adult age is considered 18 and older) or a family of 6 with children. We cannot comfortably accommodate larger groups. Our Bonus Room is approximately 250 square feet of an extra living room/great room, an office, or bedroom. We cannot call it a 3rd bedroom because it does not have a door. With the room divider, it is a bedroom. The room is equipped with a full size sleeper sofa, a desk and office chair, a recliner, and flat screen TV with blu-ray DVR. Do you have an internet surfer, children that need to watch DVDs, or someone that needs privacy? The home is modern with up to date appliances and furniture. Spacious kitchen with granite counter tops and tile floors. Wireless internet access with cable TV service. A 55 inch HD TV with sound bar is located in the living room with a blu-ray DVD player. Flat screen TVs with blu-ray DVD players are also in each bedrooms and the bonus room. A large screened Florida room is located on the back of the house furnished with outdoor cushioned furniture. A paver patio with furniture is immediately outside the Florida room with a gas grill. You can smell the sea salt when you open the door! Walk to the beach in a few minutes for the home front door to the public beach access ramps. Beach chairs, boogie boards, a wheeled cooler, beach umbrella, beach bag and beach cart are available for use. We also have a children's wagon, baby gates, and a portable handicap seat for the tub (requested in advance). 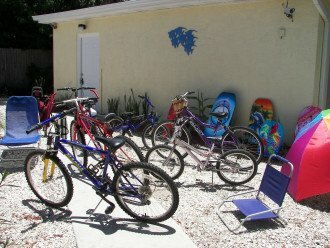 We have bikes in many sizes for your use. The home has a separate single car garage that is available for motorcycle parking. There is plenty of room to park your boat, trailer or RV right outside the house on the oversized lot. A 6 ft. fence is located on each side of the property for privacy. A private oasis for that family vacation. The home is fully stocked with sheets, blankets, towels, beach towels, dishes, summer dishes for use in the Florida room, glasses, wine and beer glasses, pots, pans, lots of electric appliances, baking dishes, utensils, beach items, and much more. We even stock spices in the kitchen! We have wine and beer glasses with an ice bucket to go with it. If you are looking for a quiet place in the sun, want to go swimming in the ocean, surfing, fishing, boating, walking or many other fun things, this Beach Home is the perfect place to stay. Want to have a great vacation and do it on a budget. Check out the items in our kitchen: Mixer, coffee pot, Keurig Mini Premium Coffee System, blender, toaster, crock pot, mini crock pot, rice cooker, electric wok, can opener, waffle maker, omelet maker, small fryer, Panera sandwich maker, Hamilton Beach Meal Maker, Presser Cooker, Electric Tea Kettle, electric chopper, and more. Make those special meals for the family in our large dining room style fully stocked kitchen. We stock all the beach items you need. You do not have to rent items on the beach. Check our room sizes: Kitchen 23 ft X 15 ft. Living Room 19 ft X 13 ft. Bonus Room 9 ft X 16 ft. Queen Size Bedroom 10 ft X 11 ft. Two twin bed bedroom 12 ft x 14 ft. Sunroom 21 ft X 13 ft. Bath 8 ft X 5 ft. Compare us to the local condos and see how large our space is in comparison to their price. This home is perfect for a couple or a family of up to 6. It is within walking distance to the beach with a grocery store near by. Tom Renick Park and Al Weeks St. North Shore Park are one mile away with parking, beach access, restrooms, picnic tables, etc. Your comfort is very important. This is not just a vacation rental property. It is our second home that we wish to share. Stay with us! Our property is maintained by performing scheduled professional pest control, filters are changed for the air/heating system, professional lawn care and other local services are contracted to maintain the quality of our home Modern heating and air conditioning system provide maximum comfort. Some Florida rentals do not have heat and use portable heaters. We have heat for the cool winter nights! Beach is within walking distance from our home's front door. Approximately 10 minute walk. 6/10 of a mile to beach walk. Up Essex Dr. right on A1A, lefts side of the road beach walk at Brooks Dr.
We are very close to the Publix and Dollar Store. Two streets over. There is also a sandwich and pizza place and Chinese carryout in the same strip mall. Subway is located in the gas station on the corner. Max occupancy: 6 (4 adults) There is a $7.00 per day per person charge for more than 4 guests. Additional overnight or additional day guests are not permitted after booking. Booked guests only. Owner must approve any additional guests. This is a property in a quiet neighborhood. Loud noise is not allowed. Children are not to be left at the property without an adult 25 or older. In addition to rental agreement, renter must provide name, address, telephone number to be reached during rental, & acceptance of no pets or smoking. Rental agreement must be signed and 50% of lodging cost deposit is required to hold property. Balance of payment is due 60 days prior arrival. Security deposit is refundable after satisfactory inspection of the property within 7 days. Please email or call if you have specific questions. THANK YOU! Yes. The renter will receive a rental agreement via email. The rental agreement would need to be signed and returned with deposit. Smoking is not permitted inside or outside the property. We are a smoke free environment to help our renters that have any type of health issues, etc. No pets of any kind or size? We are pet lovers, however some renters could have health issues with regard to pet hair, etc. Are party type events allowed at the property? Our property is for guests to enjoy a short of long stay for the number of quests registered only. We are located in a quiet neighborhood and respect our neighbors. Can I park a boat or trailer at the property? There is plenty of room to park your boat, trailer or RV right outside the house on the oversized lot. There is a driveway on the side of the house that accommodates cargo mats, etc. with easy access. Cancellation Policy: 60 day or more before reservation date, 100 percent of funds will be refunded. Less than 60 days, 50 percent of funds will be refunded, and less the 30 days, 0% will be refunded. Are there cameras on the property? House has security cameras OUTSIDE only front, side and back of house. No cameras inside house. Please keep in mind that hotels, motels, condos, shopping centers, entertainment facilities, restaurants, etc. have security cameras also. We want our guests to know security cameras are not for "watching" guests but for security of the property. We will not turn them off if requested by a guest. This is disclosed prior to rental.